Dominican international anti-terrorism training programme class participants, (left to right) Instructors Arthnel Jordon and Royston Griffin; and DASPA Chairman, Phoenix Belfield. 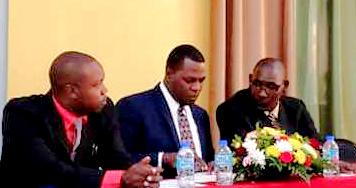 ROCEAU, Dominica– Two St. Kitts and Nevis Civil Aviation officers led an international anti-terrorism training programme in Dominica this past week. Royston Griffin and Arthnel Jordon, have been in Dominica since Monday providing screener training to the Dominica Air and Sea Ports Authority (DAPSA). The training concludes on Friday. “Screeners’ ability to detect threat items using x-ray machines, metal detection portals, physical search techniques and explosive trace detection technologies will be greatly enhanced. The training was requested by DASPA last year, but plans had to be postponed due to hurricanes Irma and Maria on Dominica and the surrounding islands. Griffin has about 10 years experience working in the aviation field as an inspector and civil aviation officer on St. Kitts and Nevis. Jordon is also an inspector and trainer with the Ministry of Foreign Affairs and Aviation.